• Magnetic Charger with self-locating base; programmable user interface; extreme output and extended runtime; rugged reliability; patented features. 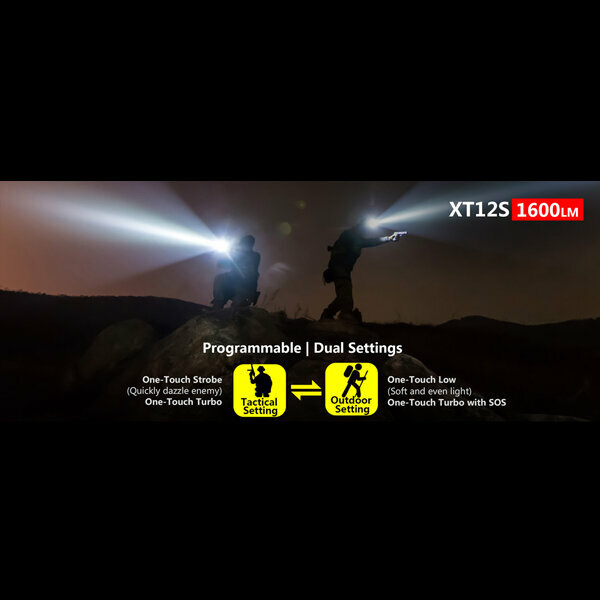 • Features XHP35 HI D4 LED, extreme spotlight capability and illuminates up to 402 meters. • Ready for duty with included KLARUS 18GT-36 3600mAh 18650 battery (featured in TESLA electric cars) for max 1600 Lumens output. • Easy Interface: One-Touch Strobe; One-Touch Turbo; One-Touch Low; SOS; Capacity indicator, Convenient Magnetic Charging; ITS temperature control; Quick mode change. • Patented Dual Tactical Tail Switch Control; non-visual tactile one-handed accurate operation by touch in the dark. ◇Tactical Setting: Classic KLARUS XT series control. One-Touch Strobe; One-Touch Turbo; Versatile for all tasks. ◇Outdoor Setting: Specifically designed for the wilderness. 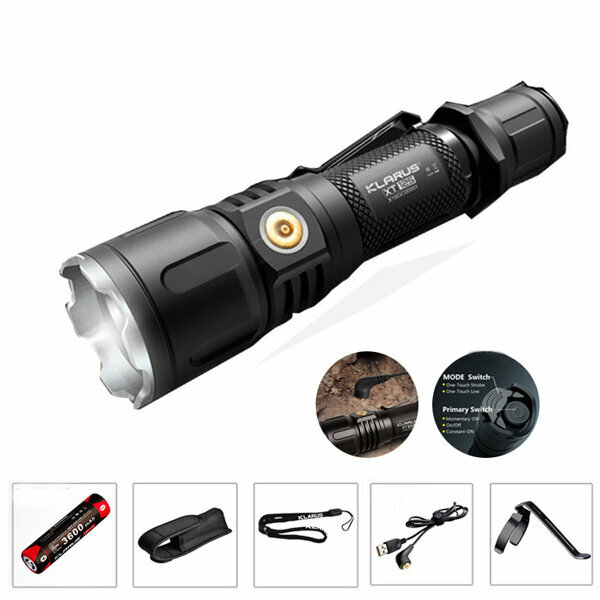 One-Touch Low; One-Touch Turbo; Multiple output levels with memory, SOS function; Suitable for all needs in Hunting, Hiking, Camping or Search and Rescue. • Intelligent Battery Load Check System compatible with a wide variety of batteries. • Convenient Magnetic Charger; Self-locating Base; Magnetic attachment; Sealed against water, dirt, and sand. • 1A recharging current; fast charging. 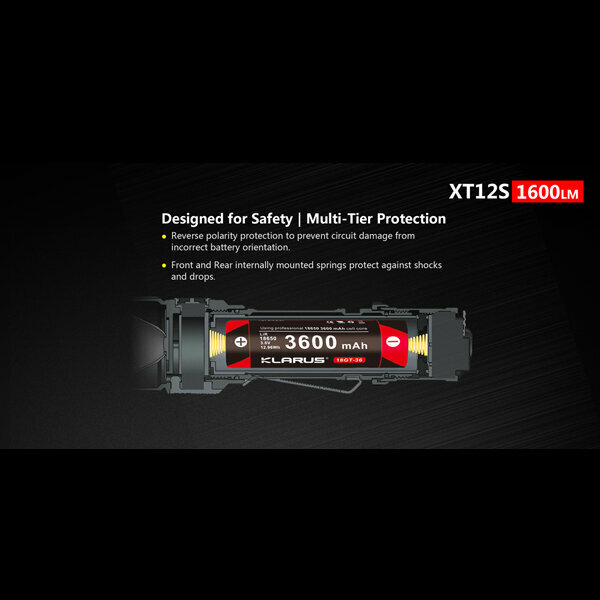 • Intelligent Temperature protection System (ITS) , monitors and auto-adjusts output levels in realtime to keep LED and crucial component safe for the best balance of performance and equipment safety. • Intelligent Capacity Indicator shows remaining battery capacity any time. • Reverse Polarity Protection; eliminates damage from incorrect battery installing. • Aero-space Aluminum alloy body with CNC machining; Mil-spec HAIII hard anodizing; lightweight and robust. • Hardened mineral glass lens with AR coating; scratch resistant.